Edmond Halley was already a well-known astronomer, mathematician and natural philosopher when, in 1698, he took command of His Majesty's Ship Paramore. The purpose of Halley's first two voyages was to test his geomagnetical theories; in the third voyage he investigated tidal phenomena. These voyages, which received royal approval, support from the Navy, and sponsorship from the Royal Society have been regarded as the first sea journeys undertaken for purely scientific purposes. Halley's departure on the first voyage was delayed because of his employment by Newton; and by Tsar Peter's desire to sail in the newly-commissioned Paramore. The first voyage ended prematurely with the court martial of Halley's first lieutenant. However, the second voyage was an eminently successful undertaking in which the Paramore made a wide sweep through the Atlantic reaching 52Â°24Â´S latitude. Halley made many observations which enabled him to produce the first isogonic map: this is also the earliest isoline map of any phenomenon. In his third and last voyage in the Paramore, in the summer of 1701, Halley made a detailed study of the English Channel. This voyage was also productive of highly original cartographic work including the first tidal chart. In this book the journals of Halley's three voyages are published in full from manuscripts now in the British Library. The journal of the third voyage is here published for the first time, and the earlier two are compared with versions published by Alexander Dalrymple in 1773 and 1775, from different source materials. 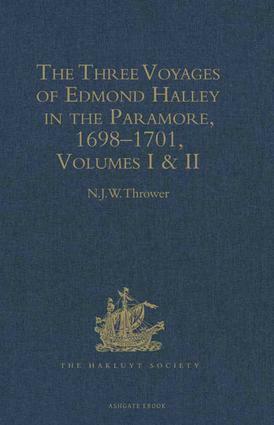 All are extensively footnoted and preceded by a scholarly introduction by Professor Thrower on the multi-faceted aspects of Halley's important voyages. The work also contains well over one hundred documents relating to the voyages, many published for the first time. The two most original but now rare maps arising from these journeys, the Atlantic Chart and the Channel Chart (in two sheets), are reprinted in facsimile for the portfolio. Other maps, portraits, drawings, etc. illustrate this latest work from the Hakluyt Society.